Summer is ending soon, but would be difficult to tell here in the Bay Area, since the summer has been cold even by the standards of a place of which Mark Twain apparently did not really say, "the coldest winter I ever spent was a summer in San Francisco" (thanks, Snopes. I will stop repeating that one to my summer students when they show up from Korea with flip-flops and tank tops). Anyway, despite our fickle weather, we have figured out that it's about time for a seasonal change because: 1. I start school tomorrow; and 2. The produce is shifting. Already. Local asparagus are long gone, and English peas are not nearly as robust as they were two months ago. And although I have recently been spending a lot of time thinking about pumpkin bread with apple sauce, fall is not here yet - oh no! Beautiful tomatoes, apparently delayed by our cold summer, have just started to appear, and berries and peaches are still in fine form. So, we'd better get in our fix of summer favorites before they disappear. We spent a good while this summer pondering peaches and pork and how we could put them together. Then, Amanda Gold at the San Francisco Chronicle wrote an article about summer condiments, one of which was peach mostarda - peaches simmered in a simple syrup with garlic, ginger, red pepper flakes, vinegar, and mustard. Perfect! We tried it once and tweaked it a bit the second time around. We served ours over brown rice with some sauteed collard greens. Peel the peaches (you can use the same boiling water technique as the one for peeling tomatoes that we discussed in our Middle Eastern Meatballs post), remove the pits, and cut the fruit into one inch chunks. Put the brown sugar, water, vinegar, garlic, ginger, and red pepper flakes in a small saucepan over medium heat and bring it to a boil. Add the peaches and cook until they are just soft, about 10 minutes. Remove the peaches with a slotted spoon and put them in a bowl. 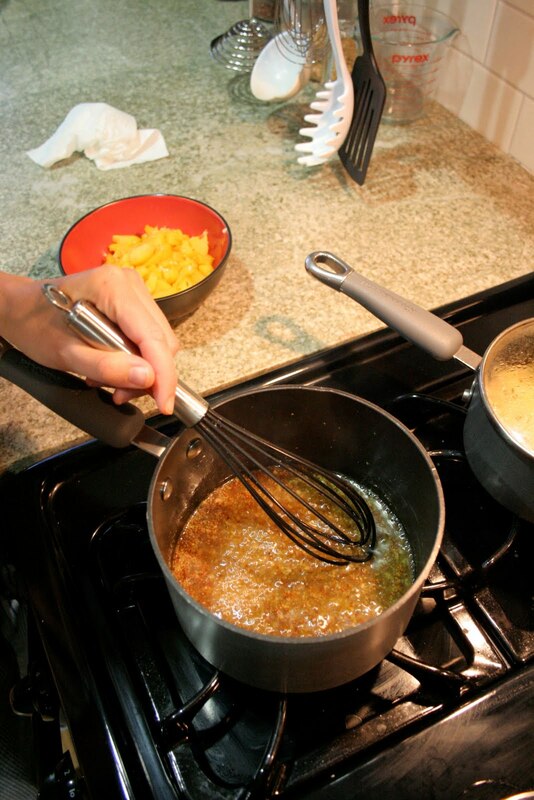 Bring the sauce to a boil again and whisk in the mustard. Add salt, if desired. Cook until the sauce has reduced and thickened slightly, about 10 minutes. Pour the sauce over the peaches. Preheat the oven to 375 degrees. To make the cooking process easier, cut the tenderloin in half or in thirds, depending how many servings you want. Pat the meat dry and sprinkle both sides with salt and pepper. Heat some olive oil in an oven safe skillet (we used our stainless steel) over medium high heat. Put the pork pieces in the pan and cook, turning to get an even brown on each side, about 2-3 minutes per side. Put the pan in the oven for about 8 minutes per inch of thickness. A few minutes before the pork is done cooking in the oven, pour the peach sauce over the pork and let them cook together for 3-4 minutes.